High mileage cars are romantic. You just can’t help to cheer on your old gal who has never given up on you and has carried your precious cargo to the moon and back. These cars always have a precious spot in our memories and we’ll always take time out to share the fish stories of their glory. Folks always look for that low mileage car. I get it, the lower the mileage, it is believed, the longer the car will last. In fact, if you see a vehicle that has around 100,000 miles on it, you probably won’t even consider buying it, thinking the car only has a few years left in it. Where is the justice? Where is the love? What about “Old Reliable” and “Good Ol’ Bessy” who never let you down. These are the cars that you just might want to take a chance on or at least, show them some honor and respect. I’m a Chevy guy and I’ve seen these vehicles routinely go to 200,000 miles or more, and they have a reputation for dependable performance. In fact, some Chevy models have driven so many miles you might not actually believe it. Perhaps the most astonishing record set by a Chevy vehicle is the 1.2 million miles that a 2006 Chevy Silverado 3500 gave a couple over seven years. When the feat was reported, the couple was still driving the truck and adding about 500 miles a day to it. The couple used their Silverado as part of their long haul business in which they drove trailers, campers and boats across the United States and Canada. They even sleep in the truck by lowering the seats and putting a queen mattress on top of them. What was their secret? Regular maintenance. It’s as simple as that. To keep your Chevy going over 1 million miles, you just need to change the oil on time, replace filters regularly, replace the tires often, and have every strange noise or knocking checked out as soon as you can. You probably won’t be putting 500 miles a day on your vehicle, which means that if you were to make it 1 million miles with your vehicle, it would likely last decades. At the time their remarkable mileage was reported, the couple said that the only problem they were experiencing was an oil leak. They also had to have the odometer reset after it went over the 1 million mark since the computer couldn’t process the numbers. Otherwise, the truck is running great. Our mileage is higher than yours! What to check out the highest mileage cars that we have recently traded for? Click Here to see them! We dare you but just know that ours is higher than yours. We trade for vehicles in all shapes, sizes, and conditions. Some of our favorites are the ones that have made more than 10 trips around the circumference of planet earth (which happens to be 24,901 miles at the equator). I love the highest mileage vehicles because they all have a different story to tell. Maybe this diesel truck did 300,000 miles worth of blue collar hard time hauling heavy loads and busting through rough terrain all it’s life. Maybe this old Chevy Lumina was the little engine that could and decided to never quit (I’ve known many of these). It’s neat to look at the inventory and just see what has made it the most mileage. When these vehicles arrive on trade, they’re like old ships coming into port possibly for the final time. I don’t know, I just think there is something romantic about a high mileage car. Sometimes I can’t believe the ones that have gone the distance. The models that got thrashed by consumer reports or maybe the Pontiac Aztec that was snickered at by JD Power. It’s these cars that decide to carry the flag for all of their mass-produced brothers and sisters that had fallen miles and miles ago. These are the cars that prove the “experts” wrong and reward their loving owners with miles of joy. Click the photo to the left because who knows what you’ll find. These old ships are only in port for a short time before someone else takes them out for maybe their last voyage and new ones are lining up to come in right behind them. But who knows, just maybe they have another couple of hundred thousand miles of life left in them and will prove you wrong. Click to see if Our mileage is higher than yours. There are only a handful of vehicles that have been documented to go past 1 million miles, and Chevy has produced two of them. A Wisconsin man hit the 1 million mile mark in 2008 in his 1991 Chevy Silverado. A camera crew filmed the moment, which was also broadcast on National Public Radio. The owner purchased the truck in 1996 when it had only 41,000 miles on it. He then used the truck for his business, which involved distributing steaks and seafood throughout the Midwest. Like the other couple who beat the million-mile mark, the owner credited regular maintenance to keeping the truck going for so long. He said that he had more than 300 oil changes in the 12 years he owned the truck. Oh, and if you’re still not sure how long it would take you to drive 1 million miles, consider that it’s the distance of traveling around the world 40 times. If you drove all 1 million miles at 60 mph without stopping, you would be driving for two straight years. Most people are happy just to make it to the 100,000 mark and maybe a little over. Yet many people start shopping for a new vehicle around that mark. However, Chevy vehicles are routinely among lists of the longest-lasting vehicles and regularly make it past 200,000 miles. The Chicago Tribune rounded up a list of the longest-lasting vehicles and found that the Chevrolet Silverado 2500 HD, Suburban, Tahoe and Silverado 1500 are regularly bought and sold at used car dealerships when they have 200,000 miles or more. Of the total vehicles in the used car market with 200,000 miles or more, the Chevrolet Silverado 2500 HD comprised 3.6 of the market, the Suburban took 3.6 percent, the Tahoe had 2.1 percent, and the Silverado 1500 had 1.4 percent. Numerous GMC vehicles, which are also under the GM umbrella, were also on the list, including the Sierra 2500 HD, Yukon XL, Sierra 1500, and Yukon. In fact, trucks and SUVs dominated the list of vehicles with 200,000 miles or more most frequently found on used car lots. GMC is a branch of GM, as well as Chevrolet, and many of the trucks created under the two nameplates are identical or very similar. 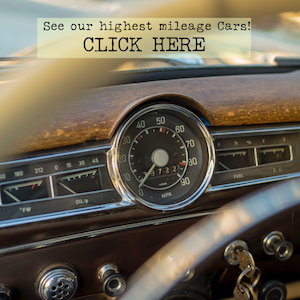 If you have a high mileage vehicle, we would love to hear your story! Tell us about and if possible send us a pic! We’d love to feature it in and upcoming blog post and even on our social media sites. Fill out the form below to contact us! Before Chevy started working on the new Bolt EV, which will get an impressive range of 200 miles on a single charge, the automaker had the Spark EV, which had a significantly lower range. The 2014 Chevrolet Spark EV was said to get 82 miles on a single charge, but officials allowed that it could go much further in “ideal” conditions. Last year, one man decided to put that to the test. The ideal conditions included driving at a steady 24 mph on a track with a warmed-up transmission and full inflated tires. Engineers also recommended driving in temperatures around 60 degrees, but the conditions on the day were about 40. To compensate, the driver disabled the MyLink system and the climate control. The car was able to go 139.5 miles on a single charge, which took almost six hours going a steady 24 mph on cruise control. While you are unlikely to drive anywhere going 24 mph for almost six hours, the test does prove that you can get much more range out of your electric vehicle if you simply alter your driving habits. Whether you are shopping for an electric vehicle or you want a dependable truck, Chevy is clearly the brand to choose. It has proven that it can go the distance time and time again. If you are ready to shop for a new Chevy, visit Dan Cummins Chevrolet Buick, the top Chevy dealership in Lexington, KY. We have a wide selection of quality Chevy vehicles at competitive prices. You may even spot a high-mileage gem or two on our lot.